Saudi Aramco applies business acumen, creativity, and cutting-edge science to transform its crude oil and gas resources into a multitude of useful products that benefit people around the world. This generates financial value for its company and the nation – but Aramco does not stop there, says the oil giant in its Annual Review for 2015. Aramco leverages each step in the hydrocarbon process from wellhead to market to create opportunities that produce shared value for its partners, its customers, and consumers in the kingdom and around the globe. The journey from raw materials to refined products and chemicals requires major investments in strategic partnerships, infrastructure, technology, and people. In 2015, Aramco continued to make the necessary investments in these areas to advance the realisation of its downstream strategy and extract the utmost value from every hydrocarbon molecule Aramco produces. Integrating across the value chain from upstream through refining, chemicals, base oils, marketing, and power generation is the key to capturing maximum value from its resources, while also diversifying risk. Integration between its domestic and global downstream facilities maximises economies of scale while securing market share in specific high-value, high-growth markets and segments. Integration across its global downstream system also helps the company take advantage of real-time synergies and facilitates the transfer of best practices and operational excellence models. Locating its refining and chemicals sites adjacent to each other and next to value parks allows the company to meet domestic and international demand for its products, spurs diversification of the domestic economy, and generates skilled employment opportunities. 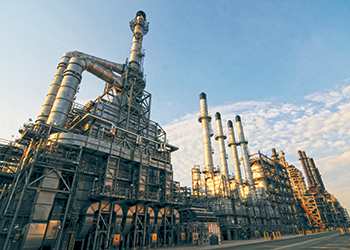 Sadara Chemical Co, Aramco’s joint venture with The Dow Chemical Company, is the largest integrated chemicals plant ever built in a single phase. It has been hailed a 'game changer' in the regional chemical industry – and for good reason. 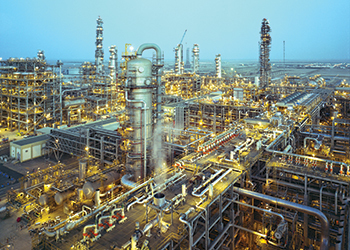 At the heart of the Sadara complex is a 'cracker' that breaks, or cracks, a mixed feed of ethane and naphtha molecules to form new ones, including ethylene and propylene, making it the first such chemicals facility in the GCC. By using naphtha – sourced from its refining network – as a feedstock, Sadara will deliver new streams of high-value chemicals, enabling the growth of new industries that will convert these streams into products used in packaging, construction, electronics, furniture, and in the automobile industry. Strategically located in Jubail Industrial City, Sadara and its integrated PlasChem value park will become a hub for chemical conversion plants, manufacturers, and associated service industries, potentially generating thousands of direct and indirect jobs for Saudis. 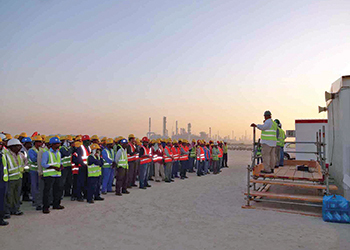 The Sadara complex on its own will employ more than 4,000 people when the plant is fully operational. The venture marks a number of milestones for the kingdom and the industry: The first polyurethane plant and 14 new technologies in Saudi Arabia, the largest foreign direct investment in the Saudi petrochemical sector, and the largest Islamic bond (sukuk) issuance in the Saudi capital market. Sadara and PlasChem Park are vital components of its overall plan to integrate refining assets with chemicals production. This approach, replicated across its domestic and international downstream portfolio, will generate significant benefits for the kingdom by adding value to the resource base, driving skilled job creation, and facilitating the transfer of knowledge and technology – core stepping stones for the country’s transition to a knowledge-based economy. The integration strategy is paying dividends. Due largely to the commissioning of Satorp and the startup of full operations at Yasref, crude oil and condensate throughput to its domestic wholly owned and joint venture refineries rose 9 per cent above 2014 levels. Internationally, Aramco pursued organic growth to build capacity and further integrate chemicals manufacturing with existing and planned refineries, and inorganic growth by forming joint ventures and pursuing potential acquisitions to increase market presence and enhance chemicals competencies. In 2015, Aramco marked historic milestones on its journey to become a world leading integrated energy and chemicals company. Sadara, its joint venture with The Dow Chemical Company, commenced first production. Through its office in Europe, Aramco signed a binding agreement to create Arlanxeo, a new joint venture with Lanxess, a German speciality chemicals company. In the kingdom, Aramco achieved greater levels of self-sufficiency in power generation and Aramco actively promoted energy efficiency initiatives while supporting the national agenda of optimising the fuel mix through the increased use of natural gas, renewables, and opportunity fuels that otherwise would be wasted, such as petroleum coke. Growing its downstream business creates additional opportunities – not only for the company, but also for new businesses in Saudi Arabia while delivering reliable, sustainable energy and new chemical products to consumers around the world. In 2015, Aramco marked significant achievements toward its goal of expanding its refining and chemicals capabilities within the kingdom, helping to diversify the kingdom’s economy, providing high-quality job opportunities for Saudis, and reinforcing its commitment to generate maximum value from the kingdom’s hydrocarbon resources. Through a calculated mix of wholly owned facilities and joint ventures, Aramco produces a slate of refined products and high-value petrochemicals for domestic and international consumers and industries, helping to enable future growth and prosperity. The Sadara Chemical Company ushers in a new era of economic diversification and growth for the kingdom, bringing with it new products, new jobs, and new knowledge. Aramco marked historic milestones on its journey to be an integrated energy and chemicals company. Located in Jubail Industrial City on the Arabian Gulf coast, Sadara will be the first chemicals complex in the Gulf Cooperation Council (GCC) countries to crack naphtha, which will support the manufacturing of diverse products not previously produced in the kingdom. The complex includes a mixed feed cracking unit capable of processing 85 million scfd of ethane and 53,000 bpd of naphtha as feedstock to produce 3 million tonnes of performance plastics and highvalue chemicals per year. Sadara will generate job opportunities for thousands of Saudis and create thousands more indirect jobs. On track for full production by early 2017, Sadara is a key element of its intent to become a leading global chemicals producer. Adjacent to Sadara is the PlasChem value park where manufacturers will transform the chemical streams from Sadara into advanced products for consumers in emerging markets, create new value chains that lift the kingdom’s chemicals industry beyond basic commodity chemicals, and foster the growth of new downstream businesses. These new businesses have the potential to create thousands of direct and indirect jobs for Saudis. The Ministry of Petroleum and Mineral Resources has approved 24 differentiated projects for implementation in the PlasChem Park. The Saudi Aramco Total Refining and Petrochemicals Company (Satorp) in Jubail, Aramco’s joint venture with France’s Total, achieved one full year of operations with no lost-time injuries. Roughly 80 per cent of the refinery’s construction activities were executed by domestic subcontractors and the company has an overall Saudisation rate of nearly 65 per cent. During 2015, Aramco began exploring the development of a world-class chemicals complex and associated value park to be integrated with Satorp and other existing sites in Jubail, further amplifying the economic benefits made possible by its downstream investments. Its joint venture with China’s Sinopec, the Yanbu Aramco Sinopec Refining Company (Yasref), based in Yanbu’ on the Red Sea coast, started commercial operations in April and has generated nearly 1,200 direct jobs and 5,000 indirect jobs, with Saudisation at the refinery reaching almost 74 per cent. Yasref also commenced exports of petroleum coke, or petcoke. Petcoke contains more energy with less ash and is a manifestation of its commitment to extract more value from crude oil while also meeting customers’ needs for reliable sources of fuel at competitive prices. Sadara, Satorp, and Yasref are cornerstones of its commitment to become a world leading refiner and chemicals producer, add value to the country’s resource base, and help drive the kingdom’s economic growth and diversification. Construction of its wholly owned Jazan Refinery and Terminal in the kingdom’s southwest continued steadily in 2015. The 400,000 bpd refinery and terminal facilities are the industrial heart of the government’s greater Jazan Economic City project, and part of a broad plan to drive sustainable economic development in the region and create employment opportunities for Saudis. Over a 15-year period, more than 70,000 new jobs could be created as the industrial city attracts a range of medium and light industries and associated service companies. The Jazan project includes the construction of the world’s largest integrated gasification combined cycle (IGCC) power plant, capable of utilising the refinery’s vacuum residue stream to efficiently generate nearly 4,000 megawatts of electricity – enough to power the refinery and also supply electricity to the Jazan Economic City tenants. By the end of 2015, engineering for the refinery was 91 per cent complete, procurement was 52 per cent complete, and construction was 14 per cent complete. Commissioning of the Jazan Refinery and completion of the IGCC power plant are scheduled for 2018. The terminal project is expected to be completed in April 2018. Also located on the Red Sea coast is the Rabigh Refining and Petrochemical Company (PetroRabigh), its integrated refining and petrochemical venture with Sumitomo Chemical of Japan. Aramco is expanding the plant in a second phase that will increase the production capacity of the ethane cracker, add a new world-scale aromatics complex, and create 22 process plants. The Phase II facilities will produce a variety of high value-added petrochemical products, supplying feedstock for a diverse array of industries. The project is on track for initial commissioning in 2016. Aramco also launched the Technical Learning Academy at PetroRabigh to train young operators and equip the Saudi workforce with advanced skills. Aramco continued its collaboration with Sumitomo Chemical on marketing and construction activities for the Rabigh PlusTech Park, an industrial zone integrated with PetroRabigh where manufacturers can establish factories to create products from the petrochemical feedstock produced by PetroRabigh. Thus far, 29 local and international companies from the plastics conversion industry have signed agreements to operate in the park. By the end of 2015, 11 conversion companies had started production with the remaining 18 firms in the design or construction phase. Out of the 29 companies, 21 are joint ventures between local owners and international partners, affirming PetroRabigh and PlusTech Park as accelerators of the kingdom’s economy and engines for domestic job creation. A project to build a new clean transportation fuel plant at its Riyadh Refinery is on track to be completed in 2016. The new plant will increase gasoline production by 2,000 bpd and produce premium low-sulphur fuel, helping improve air quality in the kingdom. Aramco is also exploring the potential of adding a full-conversion refinery and petrochemical plant to its existing Yanbu’ Refinery, increasing its competitiveness and helping to satisfy domestic demand for refined fuels. Global refining and chemicals Aramco continuously explore and evaluate opportunities, whether grass roots or participatory, to grow its refining and chemicals portfolio, particularly in China and the Asean region, an area Aramco is targeting for sustained growth. Its partnerships in refining and marketing ventures in China, Japan, South Korea, and the United States enable the company to traverse the length of the value chain from wellhead to consumer, adding value to its resources at every step. Aramco envisions developing an integrated refining, marketing, and petrochemical network and its efforts in 2015 supported this goal. Saudi Arabia, through Saudi Aramco, is the number one crude oil supplier to six major Asian countries – China, Japan, South Korea, Taiwan, the Philippines, and India – but its relationship with the region goes far beyond the reliable supply of petroleum energy to include research alliances, materials supply, education, engineering and technical services, training, and other mutually beneficial endeavours. In the downstream sector, Aramco participates in integrated refining, chemicals, marketing, and distribution companies in China, Japan, and South Korea. 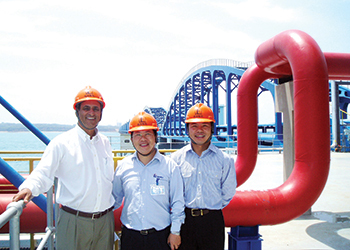 In China, its crude oil exports account for nearly 10 per cent of the country’s demand. Its portfolio of downstream assets in China is designed to benefit energy and feedstock consumers and maximise returns on the kingdom’s hydrocarbon resources. In the Fujian Province, Aramco has an equity ownership in a joint venture called the Fujian Refining and Petrochemical Company Limited (FREP). New ethylene oxide and ethylene glycol units, part of a debottlenecking project mechanically completed at year-end 2014, came onstream in the first half of 2015, increasing the plant’s productivity. 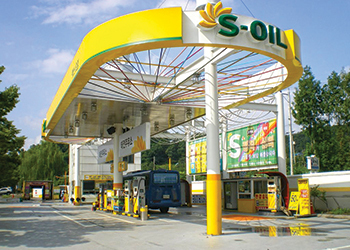 Combined with its Yasref refinery joint venture in Saudi Arabia, FREP and the Sinopec SenMei (Fujian) Petroleum Company (SSPC), a fuels marketing and distribution joint venture company, herald the opening of what Aramco anticipates being a modern 'silk road' business alliance with companies in China. This alliance will enable opportunities for investments in the energy and chemicals sectors in China and Saudi Arabia, and support research to improve energy efficiency, lower greenhouse gas emissions, and ensure sustainable, affordable energy. Aramco’s investment in South Korea’s S-Oil, one of the country’s leading refiners, complements its downstream ventures in China and Japan and creates new opportunities along the value chain in the major energy markets in Asia. In 2015, the S-Oil Board approved the funding for a project to upgrade facilities to improve the competitiveness of its fuels business and to promote further petrochemicals integration by expanding its olefins production. In November, Aramco signed a Heads of Agreement with PT Pertamina, the national oil company of Indonesia, to formalise key business principles for the joint ownership, operation, and upgrade of the Cilacap Refinery located in Central Java, Indonesia. The proposed upgrade will allow the refinery to process more sour crude oils, meet high-quality product specifications, and produce basic petrochemicals and lubricant base oils. The basic engineering design study for the refinery upgrade is expected to be completed in 2016. Ventures such as these form an essential part of its approach to cultivate downstream opportunities in Asia, an area Aramco believes will provide long-lasting prospects for investment, collaboration, and technology development to meet the growing energy needs in the region. Aramco plans to strengthen its network of offices in Asia by creating an office in the suburbs of New Delhi in Gurgaon, India. Aramco Asia, headquartered in Beijing, China, oversees its regional strategy, providing a range of services and business support to the company and its partners. The incorporation of the Aramco Asia India Private Limited office, which will be absorbing the services of Aramco Overseas Company BV’s branch office in India, will enhance its Aramco Asia network to facilitate its growing interests in India. In the US, where Aramco is the number two supplier of crude oil, Aramco continued to upgrade equipment and improve operating efficiencies at the Motiva Refinery in Port Arthur, Texas, the largest refinery in the US. Aramco marked a significant milestone in its journey to become a globally integrated energy and chemicals company when its European subsidiary, Aramco Overseas Company BV, and Lanxess, a German speciality chemicals company, signed a binding agreement in September to create Arlanxeo, a new 50-50 joint venture company. The proposed joint venture will develop, produce, market, sell, and distribute performance polymers used by global tyre and auto parts manufacturers, and in the construction and life science industries. Saudi Aramco brings resources to continue investing in new technology while Lanxess will contribute to the joint venture its existing global synthetic rubber and elastomers business units, 20 production sites, and four research centres in nine countries across Europe, Asia, and the Americas. The transaction is subject to approval by authorities, with closing of the transaction expected in the first half of 2016.Once established, the joint venture will study global growth prospects, including potential opportunities in the kingdom, further promoting economic diversification and creating high-skill, high-value manufacturing jobs. The research programmes undertaken by the joint venture, such as the development of energy saving tires, complements its own research into fuel efficient engines. The partnership with Lanxess diversifies its portfolio, increases its competitive position, and scales up its global presence while creating more commercial opportunities for sustainable growth in Saudi Arabia by unlocking the full economic potential of the kingdom’s hydrocarbon resources. Saudi Aramco Products Trading Company (ATC), its wholly owned subsidiary for trading petroleum products, traded an average of more than 1.1 mbpd of refined petroleum products and 3.7 thousand tonnes per day of chemical products. In 2015, ATC expanded its market presence by reaching out directly to third parties for product sales and purchases, optimising operations of the storage and blending facility, introducing chemical products sales and marketing, and increasing chartering activities in response to growing trade volumes. Aramco operates a kingdom-wide distribution network of pipelines, bulk plants, air refueling sites, and terminals that safely and reliably deliver crude oil, NGL, gas, and refined products to power the kingdom’s economy. Its network of pipelines is nearly 22,000 km in total length. To ensure it meets future needs for crude oil from its domestic and international customers, Aramco is planning to increase the capacity of its 1,200 km East-West Crude Oil Pipeline from 5 to 7 mbpd. Aramco also continued construction work to increase supplies of natural gas to the Central and Western regions of Saudi Arabia through its Master Gas System. The Phase 1 expansion, which will increase East-West capacity from 2.0 bscfd to 2.6 bscfd, was 27 per cent complete at year-end and is scheduled to be completed in 2017. The overall project, slated to be completed in 2018, will add nearly 950 km of new pipelines to the network. The additional volumes of gas will reduce the need to burn liquids for industry and power generation, thereby helping lower greenhouse gas emissions. By developing wholly owned worldclass facilities and participating in refining and chemicals joint ventures, both within the kingdom and globally, Aramco continued to amplify the economic impact of its downstream investments, facilitate sustainable industrial development, and drive job creation. At the same time that Saudi Aramco is consolidating its operations in the US market, the company is also keeping China firmly in its sights. Already providing 20 per cent of China’s crude oil imports, Saudi Aramco is pursuing opportunities to develop its in-country downstream capacity in cooperation with Chinese companies. China offers room for future downstream expansion, according to Amin Nasser, president and CEO of Saudi Aramco.